When one Texas community college system launched its seventh campus, the ceremony was digital: At the appropriate moment, event attendees armed with tablets were invited to swipe their fingers across their screens to "cut" the virtual ribbon on Houston Community College's new online college. 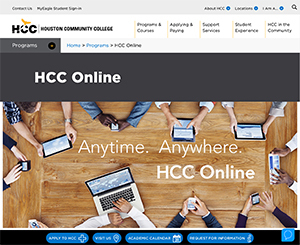 HCC Online launched with 31 fully online programs, including 15 associate degree-level and 16 certificate offerings in both academic and workforce areas. It expects to expand the total to 70 by fall 2019. According to HCC officials, the institution has 21,000 students taking one or more online classes, making it the third largest community college in the country in terms of online enrollments. Those online courses encompass 60-plus areas of study. Among the subjects covered are accounting, business, computer programming, education, fire science, liberal arts, logistics and global supply chain management, real estate, social and behavioral sciences and surgical technology. The newest campus also comes with plenty of student support. Advisers dedicated to the online students will be able to meet with them in person or via phone, e-mail, chat or videoconference. Students will also get access to counseling, "disAbility" services, online tutoring from HCC faculty members as well as technical support. For some courses, students may have to go onto campus for exams requiring face-to-face proctoring; for other classes, faculty may use online proctoring (specifically, Respondus LockDown Browser and Respondus Monitor). The campus learning management system platform is Instructure Canvas, which the college has branded as "HCC Eagle Online." Among the students HCC Online hopes to draw on are "stay-at-home moms and dads, students committed to caring for elderly loved ones at home and those already in the workforce who need additional education to move up in their careers or change their careers altogether," explained Norma Perez, HCC vice chancellor, instructional services, and chief academic officer, in a statement. One student who took advantage of online courses was Victoria Lara. This young mother had her second child when she began taking classes at HCC. "I actually had to nurse my kid while I was typing papers on the sofa in the comfort of my home," she said in a campus article. "I thought to myself, I have a laptop, I have WiFi. I can't go on campus, but if I have access to the internet, why not take a class or two and get started," she recalled. Eventually, Lara found childcare and began taking on-campus classes, graduating with an associate degree in communications. From there, she transferred to the University of Houston and received her bachelor's in communications last May. "I was the first in my family to earn a college degree, and so it was very important for me to do it, not only for me and my children, but for my whole family," Lara noted. "HCC has helped me gain confidence and knowledge that I needed to start networking and to help grow my parents' business and to show my children that education is very, very important." "HCC has offered remote learning options since the time they were referred to as distance learning, but the addition of a seventh college within the organization entirely dedicated to meeting the needs of online learners takes HCC's commitment to a whole different level," said Margaret Ford Fisher, president of HCC's online college. "We are providing students the option of completing their coursework anywhere, any time." "It is our goal at HCC to remove roadblocks that might get in the way of obtaining an associate degree or workforce certificate," added HCC Board Chair Carolyn Evans-Shabazz. "The online college does just that for potential students who, for a variety of reasons, cannot conveniently take traditional classes."